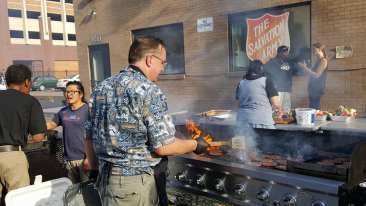 It was an amazing night feeding 350-400 people at Harbor Light / Salvation Army. God was in the house and on the street! Many thanks to our wonderful volunteers, our Breakthrough staff, Tommy’s Malt Shop (who donated the hamburgers, buns, & ice cream), and Mike and Roxy Lynch with their “smoker”! Sunday evening’s service at the Historic Wesley in downtown Minneapolis was simply amazing. If you haven’t witnessed the beauty of this church, you must join us each Sunday evening. Partner with us in serving the community. Serving others is such a blessing; I can tell you that, but you need to experience the feeling first hand. What a blessing it is to give to those who don’t have. Thank you Lord!